Using a good digital thermometer to measure temps will help you decide if you need a thermostat. Heat mats work well under glass or plastic terrariums, but with a wood cage it will need to be placed inside the cage, which will affect the temperature created by the heat mat. It will create a warmer temperature, since the heat is not being conducted through the floor of the cage. Some heat mats can even be placed on the side or ceiling of the cage to warm the air in the cage. Make sure you read the directions on the mat you buy and use it correctly. Misuse can cause damage to the wiring and create a fire hazard. Also make sure to routinely check the temperatures in the cage, to make sure nothing has changed. Sometimes room temps can affect the way heat mats work, and if they get too warm they can burn your reptile. Heat mats are especially good for terrestrial animals that would normally get some of their warmth from sun-warmed rocks or ground. These include most snakes, and some lizards. Research your animal’s needs and natural habitat to get an idea of how they regulate their body temperature in the wild. Heat lamps are also a good way to warm a cage, especially for arboreal species, and to create a basking area. 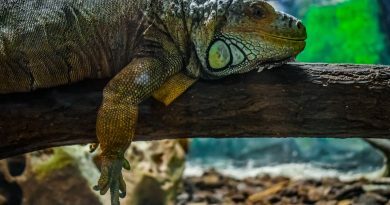 Again, they may need to be plugged in to a thermostat, but you can also try different wattages to achieve the temperatures your reptile needs. There are a lot of fancy basking bulbs on the market that claim they are good for species that need UV light, but in reality only self-ballasted mercury vapor lights produce any usable UV light. These are much more expensive than standard lights, but are a great way to provide UV light for species that need it, like most diurnal lizards, and turtles and tortoises. If your reptile does not need UV, or you choose to provide UV with a separate fluorescent bulb, then a heat lamp can be as simple as a chicken brooder lamp or a shop lamp with a ceramic socket, and a standard household incandescent bulb. The incandescent reptile bulbs on the market are mostly just nicely colored bulbs and do not really affect the reptile other than to warm it. Night time bulbs, which are usually red or black, can be useful to warm the cage at night without disturbing the animal’s normal day/night cycle. There are also ceramic heat emitters available, which are ceramic elements that produce heat, but no light. These are good for animals that need extra heat at night. With all these products, be careful that your reptile cannot come into contact with the heat source. They can cause serious burns, and should be placed outside the cage, or behind a screen or other barrier if used inside the cage. Make sure you test the temperature of anything your animal can come into contact with before placing your pet in the cage. If it’s too hot for you to touch, it can burn your reptile. Heat lamps are also good for providing light for those species that don’t need UV, but for most lizards and all turtles and tortoises, you will also need a separate UV bulb. The afore-mentioned mercury vapor light work well as long as they produce the temperatures you need. Unfortunately, they cannot be used with thermostats or dimmers, because they will reduce the amount of UV as well as the amount of heat. You can adjust them by hanging them above the cage, and adjust the height to raise or lower temperature, but if your reptile cannot get within 12 inches of the bulb, they will not be getting the full benefit of the UV. Some people find it easier to use a separate fluorescent bulb for UV. But not just any fluorescent bulb will work. Read the label, and find a bulb made specifically for reptiles. I don’t usually recommend a certain brand, but in this case I do. Reptisun 5.0 is the best brand of fluorescent currently on the market. They do need to be replaced about every six months, so marking the date on the bulb or your calendar is a good reminder. No matter what lighting you use, you will need to keep it on a regular day/night cycle. Regular appliance timers from the hardware store are a great way to do this. You can get anything from a cheap $5 timer with a single on/off cycle, to a fancy digital timer that will adjust more accurately. On average, most reptiles need a 12 hour on/12 hour off cycle, but for breeding, some reptiles need their cycle to be adjusted at different times of the year. Research your species to determine what the best day/night cycle will be. Oct 30, 2018 KristaLB Comments Off on Do Iguanas Make Good Pets?